Suitable for motor control and dc-dc applications in portable battery-powered electronics. 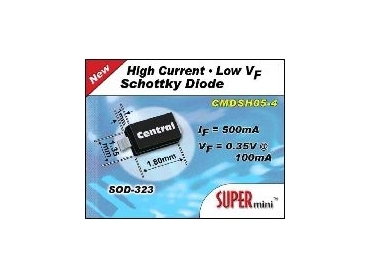 CENTRAL Semiconductor, represented in Australia by Logic 4 Australasia , has released the CMDSH05-4 high-current, low-VF Schottky diode packaged in a SUPERmini SOD-323 package. It offers a continuous forward current of 500mA and a maximum VF specification of 0.35V at 100mA and 0.47V at 500mA. It is suitable for motor control and dc-dc applications in portable battery-powered electronics. Central Semiconductor's EED Schottky diodes typically have a forward voltage drop of at least 50% less than non-EED diodes. The SOD-323 surface mount package offers a nominal profile under 1mm.